The youngest pilot of the biggest program to support Brazilian motoring, Heitor Farias put on a show at the São Paulo Kart Cup, winning the race after starting last – Russo was also a highlight on the Rok Cup; abroad, Felipe Fraga and Marcos gomes got top 10. 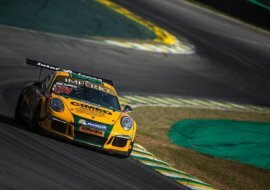 The cimed racing team, which is part of the biggest platform to support Brazilian motoring, has another weekend of accomplishments in Brazilian and foreign tracks. Heitor Farias stood out at the São Paulo Kart cup after winning the second cadet round. Starting at the last position, the 8 year old pilot put on a show with 18 overtakes before getting the lead. “I was very happy about winning this race here at the São Paulo Kart Cup. We had problems on the first round, that’s why I needed to start last on the second one. I was able overtake all competitors and arrived first. 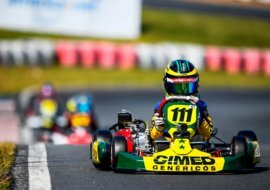 I hope to continue conquering other victories in order to get to the Brazilian Kart cup in June”, said Heitor, who did the best round on that race and climbed the podium with the sum of both rounds. Also at the Granja Viana go-kart track, another member of Cimed Racing was victorious: The experienced Renato Russo won the Rok Cup senior category – getting second place alongside Welson Jacometti. The biggest support program to Brazilian pilot also stood out abroad, with two Cimed Racing champions on Stock Car, in two of the main tourism championships in the world. In France, Felipe Fraga was eighth in the six hours of Paul Ricard, valid stage for the endurance championship of the Blancpain GT Series. The pilot from Tocantins competed with the Strakka Racing team and drove the Mercedes-AMG GT3. Sharing the car with the French pilot, Adrian Tambay and the German one, Christian Vietores, Fraga celebrated the good result on the race with 51 cars. “We got a great result here in Paul Ricard. 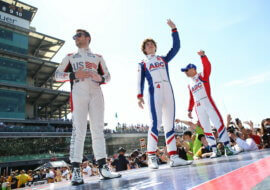 At the beginning we went from twenty first to twenty eighth, but soon recovered to the eight position. It was an incredible experience, I thank the people of Strakka Racing for the invitation and once again Cimed Racing for the support”, said Frada, who won Stock Car in 20160. Vice leader on Stock Car in 2018 and champion in 2015, Marcos Gomes competed in another round of Nascar K&N East and got top 10 with the car of the NextGen Motorsports team. The round of the strongest Nascar regional championship was in Memphis, Tennessee. 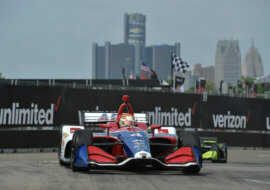 Also in the US, Matheus Leist competed on the seventh round of Indy: The pilot arrived in fourteenth place last sunday after having finished on the top 15 with the AJ Foyt team on Saturday. The Cimed Racing team will be back on tracks this week with another round of Porshe (Which will be done in São Paulo) and also of the Paulista Light of Kart, at the Aldeia da Serra go-kart track.